Dr Martin Zaltz Austwick is a Senior Lecturer at the Centre for Advanced Spatial Analysis (Bartlett). Martin’s research and teaching makes extensive use of a wide variety of data sources including government data, business data and textual data. Our interview with Martin provides a clear example of how researchers are already making extensive use of open data and have a desire to share their own data with broad audiences. The interview also emphasized some of the challenges faced by researchers who want to make their data available as a services through interactive websites or APIs. A particular challenge is that whilst funders cover some of the costs associated with Research Data Management usually these don’t include funding after projects have finished to maintain ‘live’ data services. Supporting researchers in their efforts to present data in new and innovative ways is an area university support services may want to continue investigating. Watch Martin’s 5-minute interview (opens a new window in Youtube). 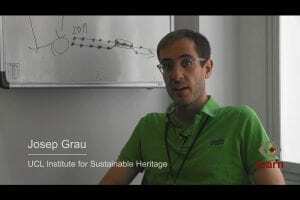 Dr Josep Grau-Bove is a Lecturer in Science and Engineering in Arts, Heritage and Archaeology; he works at the Institute for Sustainable Heritage (Bartlett School Environment, Energy & Resources). He is the Assistant Director of one of the Institute’s Programmes for MRes students. In our interview he reflects on the benefits of Data Management Plans for research students, the technical challenges of managing data and the importance of data sharing within his Institute. He also highlights the need to raise students’ awareness of good practices in data management. Watch Josep’s 4-minute interview (opens a new window in Youtube). This week is Love Data Week an international event ‘to raise awareness and build a community to engage on topics related to research data management, sharing, preservation, reuse, and library-based research data services.’ As part of Love Data Week, a number of free events are taking place across Bloomsbury. We will also be publishing short research data case studies as part of Love Data Week. These case studies cover a range of disciplines and types of data generated accross UCL. The second case study looks at research data that was collected as part of the Poverty and Ecosystems Impacts of Tanzania’s Wildlife Management Areas (PIMA) project. Poverty and Ecosystems Impacts of Tanzania’s Wildlife Management Areas (PIMA) is a three-year interdisciplinary research project which aims to discover how Tanzania’s Wildlife Management Areas have changed people’s lives and their effects on wildlife and the environment. The project received funding from Ecosystem Services for Poverty Alleviation (ESPA) a project co-funded by NERC, DfID, and the ESRC. The interdisciplinary nature of the project led to a broad range of data being collected including data on household income, environmental data and qualitative data. Data was captured electronically, anonymised, and stored using cloud storage. The data will be shared using the UK Data Archive. The data will also be described in a forthcoming data descriptor paper in Scientific Data. This paper will provide an opportunity to provide further context to the project’s data and aid others in reusing this data. PhD and MSc Students from the University of Copenhagen were involved in the project. The insights from the project also inform teaching from Katherine Homewood. There were a number of challenges during the project. One challenge was dealing with the volume of the data. Carrying out statistical methods on the data which aimed to be quasi-experimental involved the use of Bayesian hierarchical models. Though there was support from a statistician during the project further support in this area of analysis would have been valuable for the project. Further support for the project can be found on the project’s website. The first case study looks at the British Sign Language (BSL) Corpus. The British Sign Language (BSL) Corpus is a collection of video clips showing Deaf people using BSL, together with background information about the signers and written descriptions of the signing. The video clips were collected as part of the original BSL Corpus Project, funded between 2008 and 2011 by the Economic and Social Research Council. The data are all video clips (and associated metadata) showing 249 deaf people from all over the UK using British Sign Language. During the project the data was stored on a secure server within Deafness Cognition and Language Research Centre at UCL. The data are archived with UCL Digital Collections under the British Sign Language Corpus Project (CAVA Repository). There are two points of entry for working with the BSL Corpus data – one for researchers (via UCL CAVA) and the other that’s more user friendly for casual visitors (intended for the Deaf community). This approach offers an example of how data can be shared effectively for different audiences and make the research data more accessible to communities represented in the data. The data collected in the CAVA repository has been used extensively for teaching of Masters students. There were a number of challenges to the project. These include challenges related to data collection and the disclosure of names in the interview data by participants. As a result of some of these potential discoloures of names data had to be restricted to registered researchers who sign a user licence before accessing data. You can find further information about the project on the project website and an article on the project.